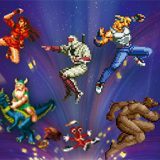 Earlier this year, Sega Mega Drive Classics became the most recent re-release of Sega’s 16-bit back catalogue on PlayStation 4 and Xbox One, and it was only inevitable that a Nintendo Switch release would follow. I do quite enjoy a good Mega Drive collection from time to time – the Sonic Mega Collection Plus on PlayStation 2 and Sega Mega Drive Ultimate Collection on PlayStation 3 were both pretty comprehensive and fleshed out releases that I sank far too much time into. Now, Sega Mega Drive Classics on Switch brings over 50 games to the console, for play both at home and on the move, which is an attractive proposition. The full list of titles in the collection includes Alex Kidd in the Enchanted Castle, Alien Soldier, Alien Storm, Altered Beast, Beyond Oasis, Bio-Hazard Battle, Bonanza Bros., Columns, Columns III: Revenge of Columns, Comix Zone, Crack Down, Decap Attack, Dr. Robotnik’s Mean Bean Machine, Dynamite Headdy, ESWAT: City Under Siege, Fatal Labyrinth, Flicky, Gain Ground, Galaxy Force II, Golden Axe, Golden Axe II, Golden Axe III, Gunstar Heroes, Kid Chameleon, Landstalker, Light Crusader, Phantasy Star II, Phantasy Star III: Generations of Doom, Phantasy Star IV: The End of the Millennium, Ristar, Shadow Dancer: The Secret of Shinobi, Shining Force, Shining Force II, Shining in the Darkness, Shinobi III: Return of the Ninja Master, Sonic 3D Blast, Sonic Spinball, Sonic the Hedgehog, Sonic the Hedgehog 2, Space Harrier II, Streets of Rage, Streets of Rage 2, Streets of Rage 3, Super Thunder Blade, Sword of Vermilion, The Revenge of Shinobi, ToeJam & Earl in Panic on Funkotron, ToeJam & Earl, Vectorman, Vectorman 2 and Virtua Fighter 2. It’s a thick slab of games to read through, but a cursory scan will reveal that there’s plenty of great titles to get stuck into. Of course, everyone’s favourite hedgehog makes an appearance with two fantastic platformers (Sonic, Sonic 2 – along with two mediocre other outings), Comix Zone is a great-looking and inventive brawler and Gunstar Heroes is a fantastic run-and-gun shooter. You get all three Golden Axes, Shinobi and Streets of Rage games, along with both Vectormans and ToeJam & Earls, meaning there’s plenty of series to work your way through from start to finish. RPGs are also very well represented, with the fantastic Phantasy Star represented with three titles, along with the Shining Force series and the honestly pretty average Sword of Vermillion. The majority of what’s been included holds up pretty well, and you can honestly lose hours playing through Phantasy Star IV or getting all the Chaos Emeralds all over again in the Sonic games. A save state system has been implemented that’s reasonably easy to access – even if it’s a couple of menus away – and helps with the difficulty that some of these older games presented as well. Online multiplayer is also available, although at the time of review I wasn’t able to find anyone through matchmaking, since the game isn’t actually out yet. However, it’s also notable what hasn’t made the cut this time, with big games like the Ecco series, Sonic 3 & Knuckles and even unlockable extras like Master System and Arcade games that have been present in past collections all missing here. While the number of games in this release is respectable, there’s no real additions that fans have been pining for that are exclusive here – no Aladdin for instance – and for some reason there are still some games like the hugely inferior port of Virtua Fighter 2 that get included again and again despite their mediocrity. On Switch all the games run well and with no emulation issues that I could detect. Upon resuming a game from a short break away on sleep mode, there is an occasional 1 second stutter, but it’s an exceptionally nitpicky thing for me to bring up. 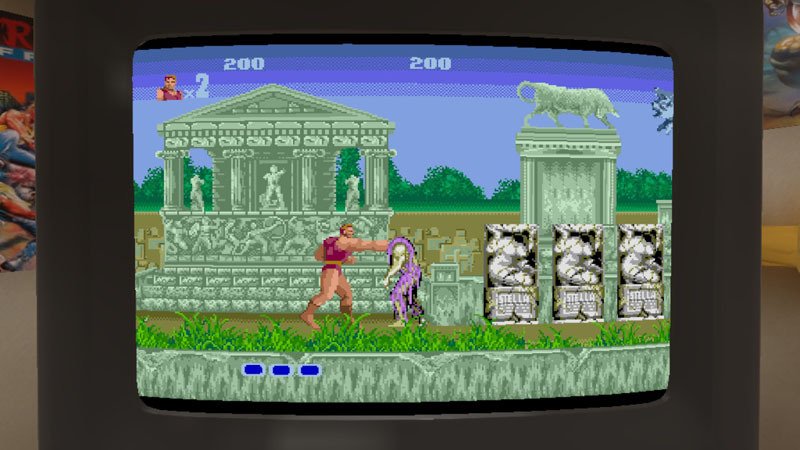 There are plenty of emulation options you can fiddle around with, including different pixel scaling options, scanlines filters and different borders. It’s all charmingly presented in a 3D recreation of a Sega fan’s bedroom too, with a shelf full of the collection’s games, as well as classic posters up on the walls and props lying around on the floor. You can even play on the bedroom’s TV without going into full-screen if you want. It’s a little disappointing that despite the cute 3D presentation, there isn’t more here for Sega fans in the way of extras. While you can scroll through games on the shelf, you can only see their spines and not look at the cover art. There’s no in-game recreations of their manuals, and there’s no unlockable art or behind-the-scenes videos that might have been present on older collections. You only have lists of ‘feats’ and ‘challenges’ to work towards for your own satisfaction – the former are essentially the in-game version of Trophies, while the challenges are bite-sized situations of high difficulty in various games that you can boot up straight away. Also, while the game runs fine in both handheld and docked modes, the text in the menus can be hard to read on the Switch’s screen in handheld mode, and it’s especially small in the emulator settings menu. While it’s a solid list of games, it’s starting to get disappointing that Sega doesn’t make more of an effort to dive deeper into their catalogue to update games that we haven’t seen before. Obviously, licensing isn’t cheap, but the lack of cross-publisher content means we just don’t see a lot of classic titles the system was known for like Mortal Kombat, Rocket Knight Adventures, Aladdin, NBA Jam and Jurassic Park. The Mega Drive’s peripherals continue to be excluded as well – there’s actually a few games on 32X and Mega CD worth salvaging for the present day that I’d love to see get the Classics treatment, and it seems like it’s never going to happen. 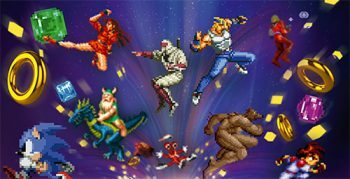 It’s easy to complain about what isn’t here, so I’ll leave my belly-aching at that, because what is here is a good collection of Mega Drive titles, that while not entirely representative of the console as a whole, benefits from the portability of the Switch and the unique presentation of the collection. 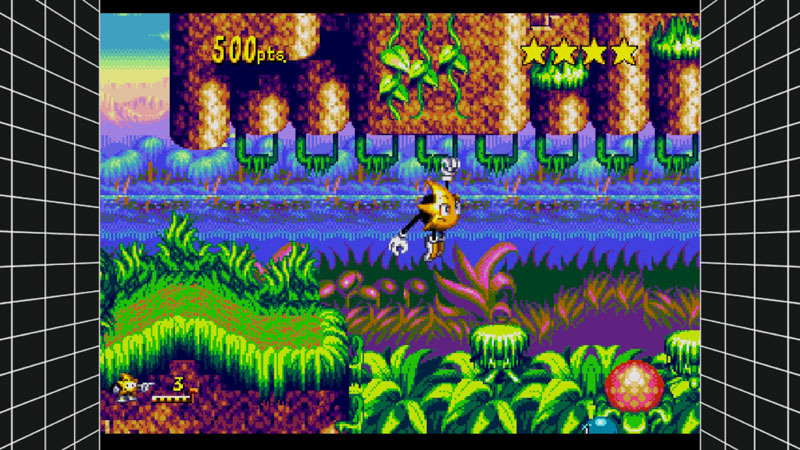 Sega Mega Drive Classics will definitely scratch your nostalgia itch.